Winter identification of trees usually includes examining the bark, twigs and buds, and sometimes the general form of the tree in question. Branching patterns are seldom used for identification, and are often either non-specific or common to a number of different trees. The Black Gum (Nyssa sylvatica) is an exception, with its unique horizontal branching easily seen from the ground. The upper branches and twigs come off the main branches at right angles, creating an antenna-like form that is striking in its regularity. See the two examples below. 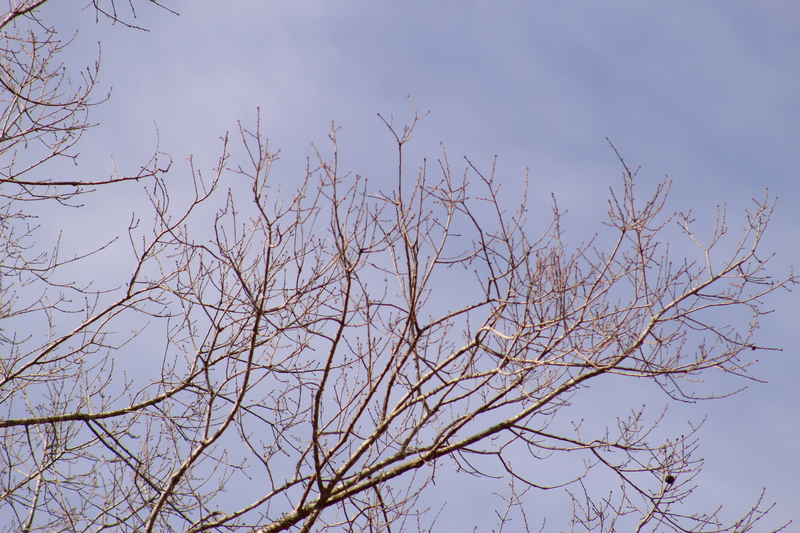 For contrast, the branches of a Willow Oak (Quercus phellos) are shown below. 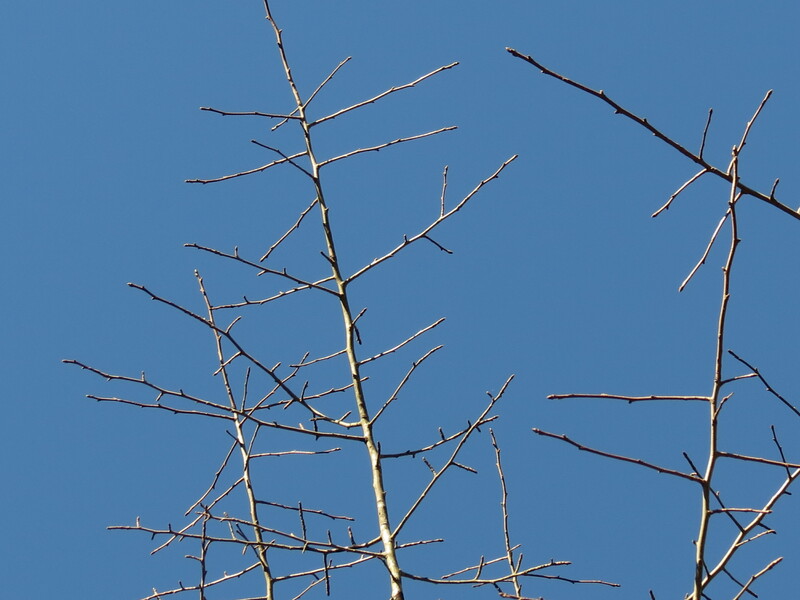 Typical of most oaks, the branches reach upward and are often curved, with few if any right angles to be seen. 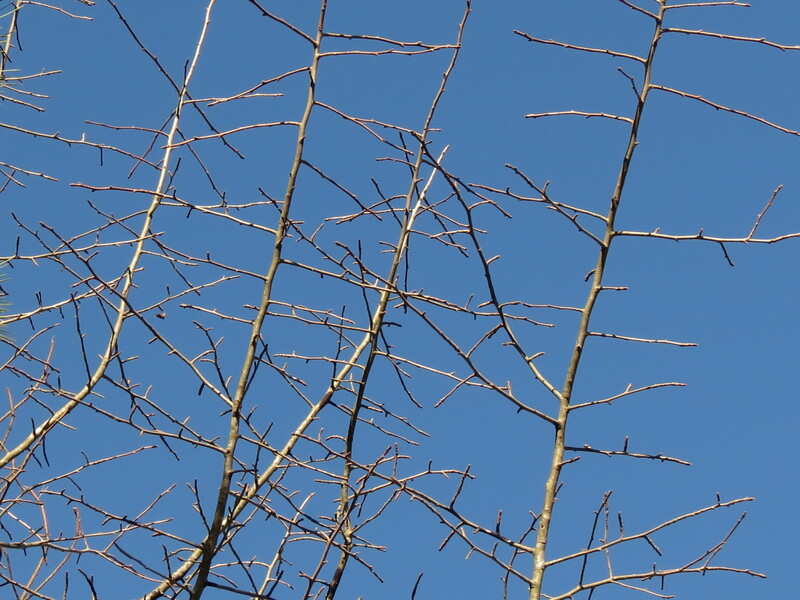 Not totally unique but distinctive is the bud and twig patterns of the Slippery Elm (Ulmus rubra). 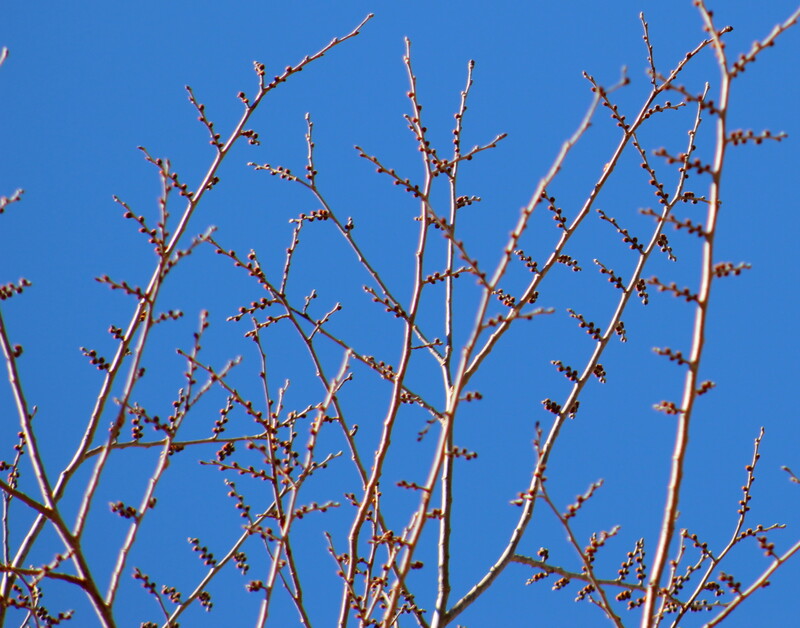 The twigs, with their large, red buds, form a zig zag pattern that appears almost electrified when viewed from below. 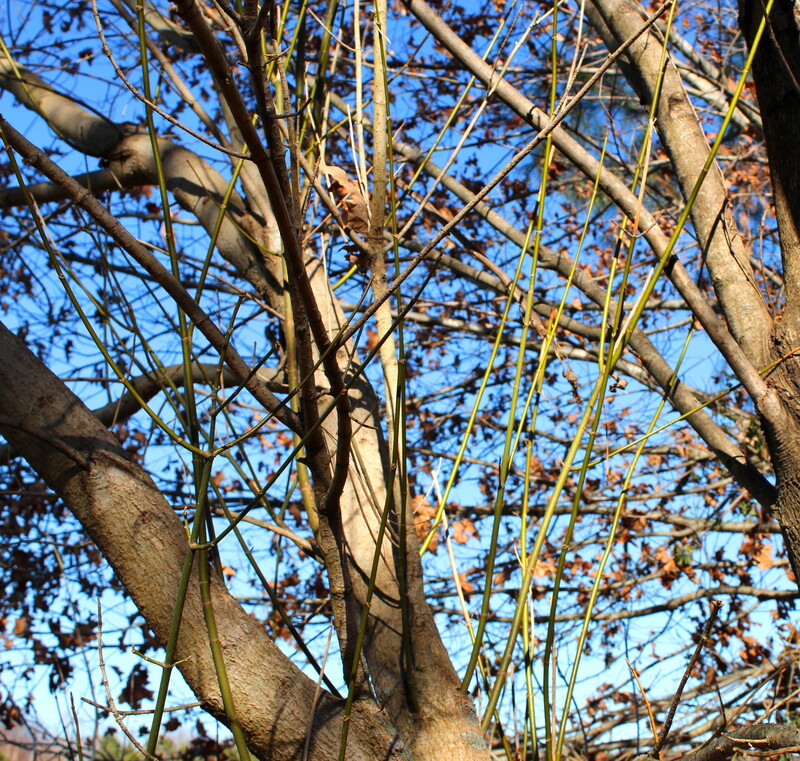 The Box Elder (Acer negundo) is another tree that is usually easy to identify in winter. 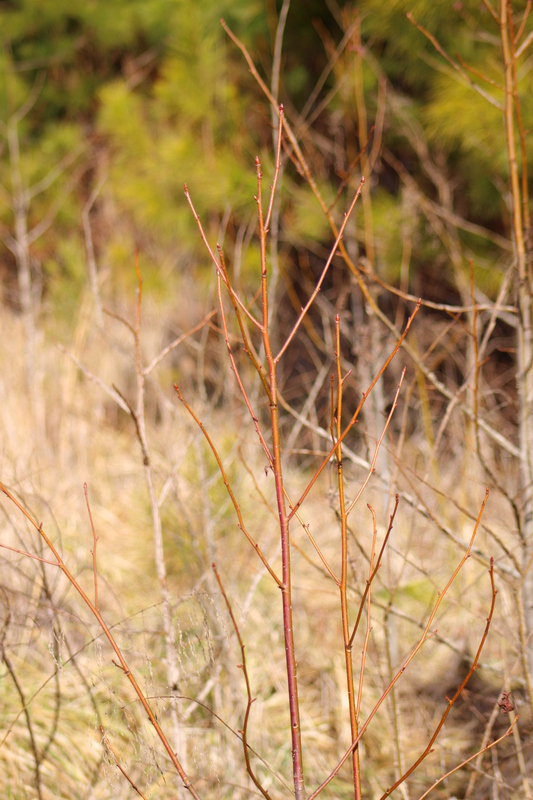 As Box Elders mature, they produce a copious number of branches and shoots. Even older trees produce clusters of shoots, sometimes directly from the trunk. These shoots are smooth and are a distinctive green color, which causes them to stand out against the browns and grays of winter. The new branches of a young tree are pictured below. Below is an older, mature Box Elder with clusters of new green shoots coming out in several places along the main trunk of the tree. 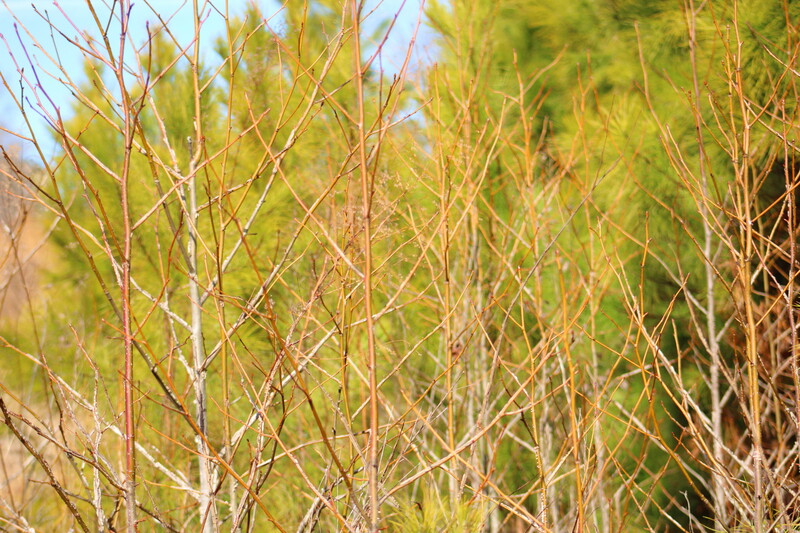 The Sweet Gum, Liquidambar styraciflua, is both common and abundant in Central North Carolina. And it is very easy to identify in winter due to the high numbers of new, yellow-brown branches and twigs displayed by young, growing trees. Below is a group of young Sweet Gums. In the second photo, the large buds stand out even at a distance. As Sweet Gums age, and developing bark begins to cover most of the branches, the distinctive large, terminal buds remain conspicuous. They are colorful and shiny, almost as if they had been waxed. And the overlapping bud scales are easy to see. They display a large range of colors that are often not mentioned in the bud identification guides. The yellow-brown bud below is the most common. 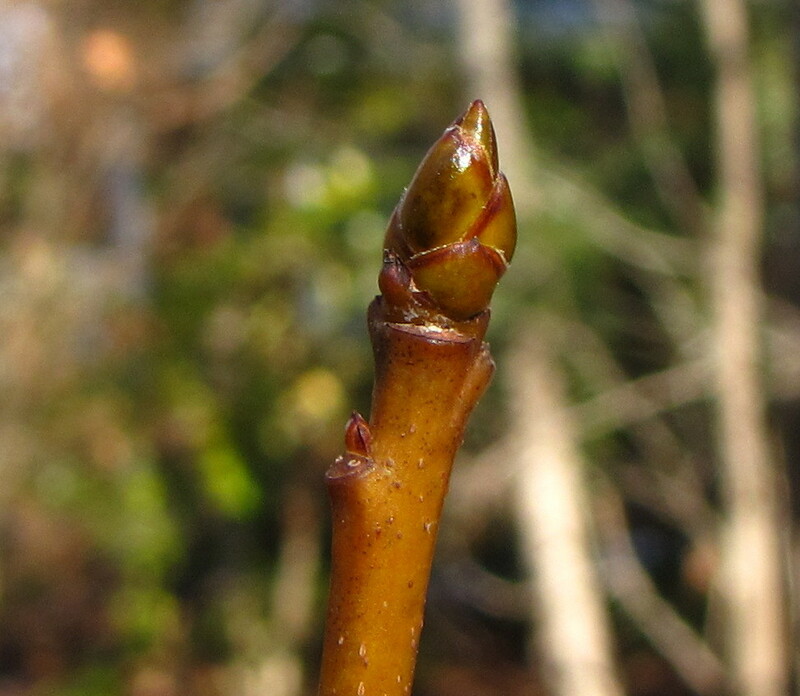 Shiny, reddish buds are seen occasionally. 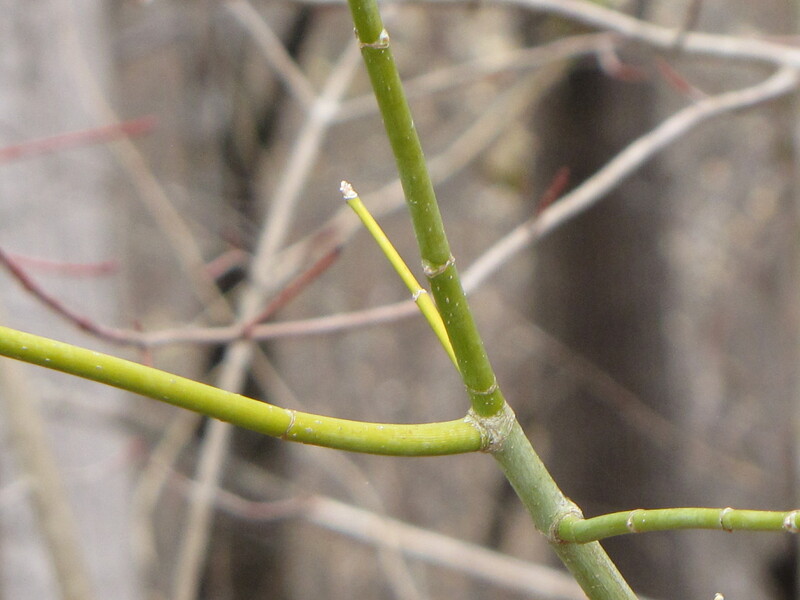 And buds with a green tint are also seen. Oaks have alternate buds that occur in clusters at the tip of the twig. Bud scales are obvious and the bud color is usually a shade of brown or red. 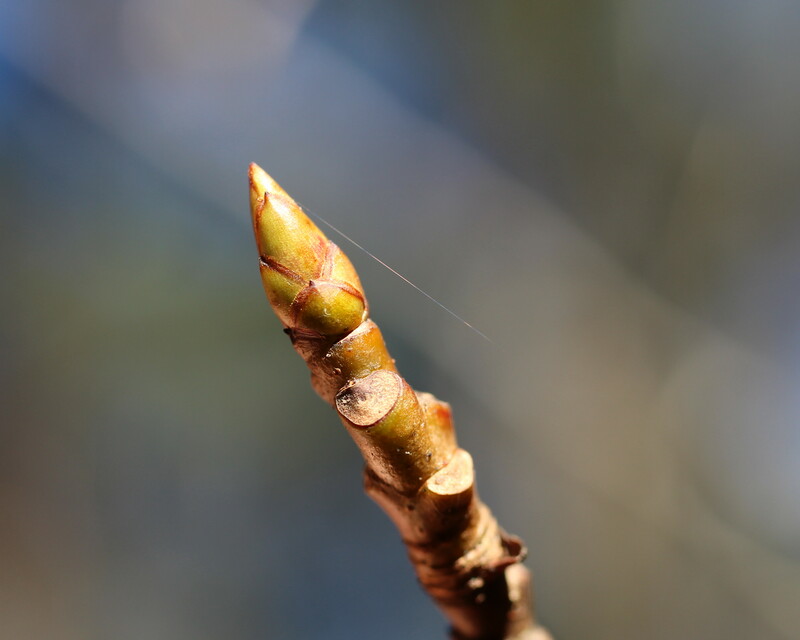 Determining the exact species of oak using the bud and twig can be done, but is somewhat of a specialty. 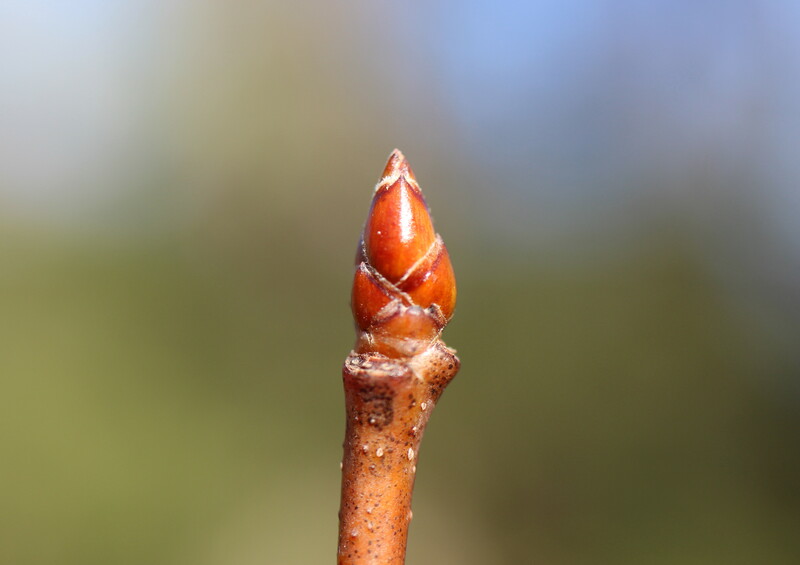 Many twig and bud identification keys simply end with “Oak” or “Quercus sp.” and don’t try to go any further. 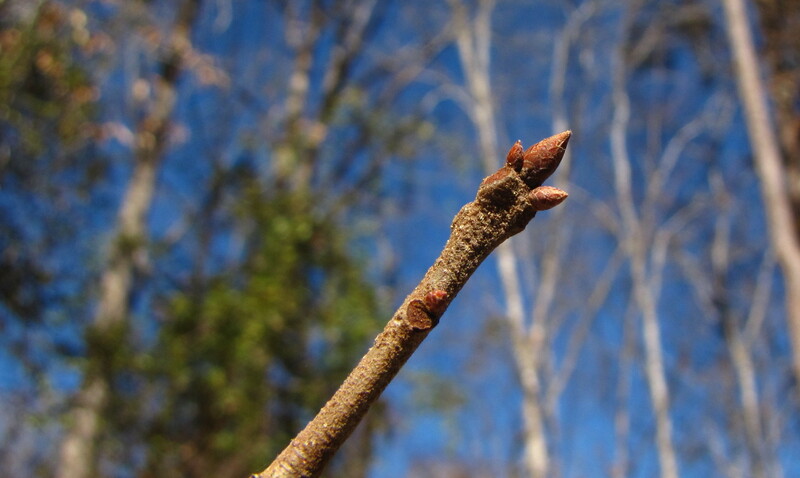 Below is the twig and bud from a Southern Red Oak (Quercus falcata). This entry was posted in Uncategorized and tagged Acer negundo, Black Gum, Box Elder, branching patterns, Liquidambar styraciflua, Nyssa sylvatica, Quercus falcata, Quercus phellos, Slippery Elm, Southern Red Oak, Sweet Gum, twig and bud identification, Ulmus rubra, Willow Oak. Bookmark the permalink.